Where next for Louis Van Gaal's Manchester United? 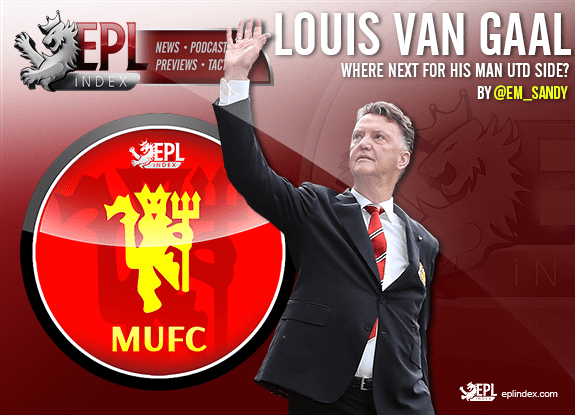 EPL Index > EPL Index Featured Article > Where Next for Louis Van Gaal's Manchester United? When Liverpool sent Louis Van Gaal’s Manchester United side crashing out of Europe, the Red Devils’ fans were left feeling deflated and it’s not surprising as they’ve not had much to cheer about so far this season. But where next for Manchester United? The side are struggling to make progress under their Dutch boss, Van Gaal, and fans have grown restless and impatient in recent weeks after inconsistent performances have dented their league campaign this year. The Red Devils currently lie in 6th position in the Premier League, amidst an on-going battle for the fourth Champions League spot. European football is a necessity for Manchester United and it’s become such a common occurrence to see their name lined up amongst Europe’s elite, it would be unthinkable to see United out of action. However, since Sir Alex Ferguson’s departure, England’s most successful club has dropped down below the Champions League spots and have been branded ‘average’ for most of the season. Exit from the Europa League means Manchester United’s final chance of silverware is in the FA Cup where they await a clash against West Ham United to progress to the semi-finals. Former favourites and local rivals, Manchester City, were knocked out by Everton who will be United’s opponents should they make it out of the quarter-finals. If so, FA Cup glory could be within touching distance and it would be a huge boast for the fans to have something worth celebrating about. It’s no easy task though and the pressure of winning the cup could prove too much for this young United side. Europa League success would have ensured Manchester United a place in next season’s Champions League competition but after Thursday’s defeat, all the pressure for Van Gaal’s side is their league performances. It’s essential the team gain some consistency in the Premier League to climb their way up the table and guarantee that all-important European place. It’s not all doom and gloom though and there are still positives for Manchester United. In the last six league games, they’ve picked up ten points, including three points against Arsenal, Watford and Stoke City with a draw against Chelsea. As well as improving results, fans have seen the uprising of youngsters who have been thrust into the limelight, seemingly unintentionally due to injury but they’ve impressed nevertheless. None more so than Marcus Rashford, who’s brace against Midtjylland on his debut was followed up by another double against Arsenal in his first league appearance for the club. As well as the refreshing signs of youth success at Old Trafford, there’s been comfort in Memphis Depay’s return to form. After a slow and underwhelming start to his Manchester United career, his performances against Stoke City and Arsenal in recent weeks have been a welcomed sight for fans of the Premier League side. Although Van Gaal’s side have a lot to prove and a long way to go this season if they are to avoid a backlash of anger, the team possesses talent of the highest calibre in Juan Mata, Anthony Martial and David De Gea. Those players have a huge responsibility to carry this team but if they succeed in securing European qualification, they can be applauded for a resilient second half to the league campaign. With nine games left to play in the Premier League season, the return to fitness for some of Manchester United’s senior players could prove vital in the run-in to the end of the season. Chris Smalling’s addition to the back four can’t be underestimated and his return will be a great boost for all involved with Manchester United. The return of their captain, Wayne Rooney, will hopefully come sooner rather than later. It will be interesting to see whether the impressive Marcus Rashford will lead the United front line on Rooney’s return but even so, it’s only positive for Van Gaal to have his captain back in the dressing room with tough games yet to come. The next step for Manchester United is simple because there’s only one that matters – Champions League qualification. Van Gaal’s men must make league form a priority and consistency is now more important than ever as Manchester United battle it out for the fourth spot. FA Cup victory will be a warm added bonus but without European qualification, United’s season can only be described as a disaster. Under no circumstances will fourth place secure a ‘successful’ season for Van Gaal but it would provide a very helpful life-line for the manager and his under pressure squad. Categories: EPL Index Featured Article, EPL Team Analysis, Manchester United, and Manchester Utd (NN).' 'Tags: "Manchester United", Anthony Martial, Champions League, David de Gea, Juan Mata, Louis Van Gaal, LVG, and premier league. Was The Defeat Against Norwich One Too Many for Van Gaal?